Bob hairstyles are one of the hottest hair trends in Hollywood. They are super easy to style and so versatile. You can experiment with colors and styling products to create a variety of looks to match any mood. Among all of the women haircuts medium bob is probably one of the most varied. 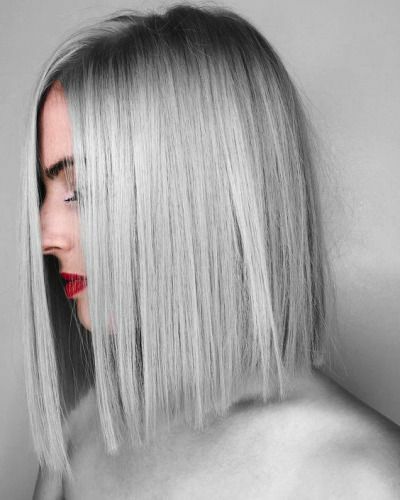 If you’ve just got a fresh blonde balayage, you have a great opportunity to showcase its clearly displayed colors through straight sleek strands. What else makes this medium bob haircut stand out is the angled front, which gives more definition to the sharpness of the jawline. If you want to emphasize the edginess of the cut, harness it with a side part. However, to keep your bob smooth and sleek, you’ll need to make a little effort. Always wash your hair with straightening shampoo and conditioner. Before styling, don’t forget to use a frizz-fighting product. To achieve the desired slickness, use either a straightener or a blow dryer with a round brush. Today we have collected 50 chic and trendy straight bob haircuts and colors to make you look special. Take a look at these pics of these bob haircuts and make sure you check out every single pic below to be inspired and to get some great ideas for your next haircut. We hope you enjoy these designs as much as we do!